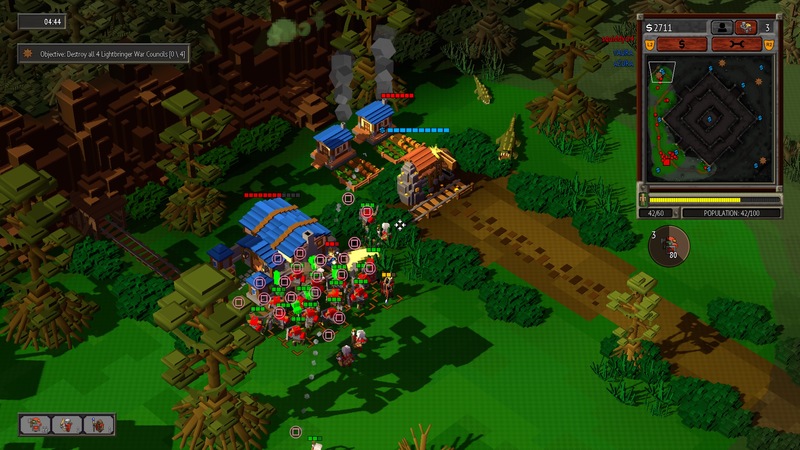 8-Bit Hordes is a fantasy real-time strategy title from Vegas-based dev team Petroglyph Games who are best known for being what was left of Westwood Studios, the creators of the legendary Command and Conquer series, after EA took them over and ultimately disbanded them. With a large catalogue of strategy titles behind them, it was no surprise that this follow up to 8-Bit Armies would follow suit and so that’s what you get here, another RTS, but with Petroglyph you tend to get a more beginner-friendly, casual kind of strategy game which is great if you want to dip your toe into the genre. Maybe not in terms of difficulty, more on that later, but in terms of rules you can understand and tech trees that aren’t too complicated. 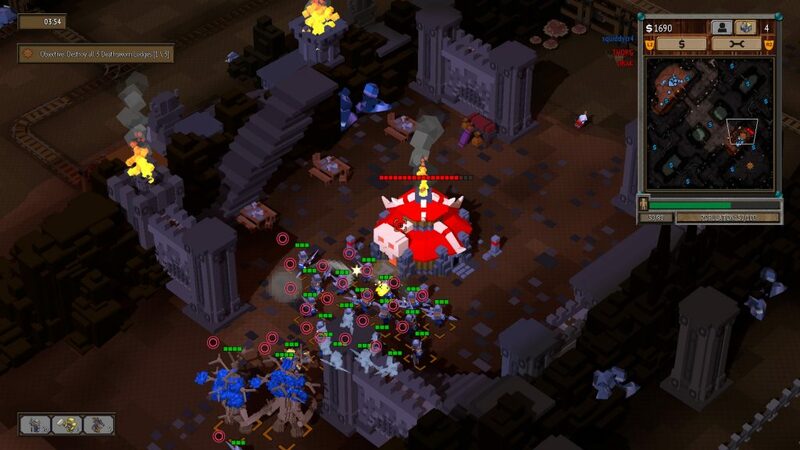 When Mike reviewed 8-Bit Armies, which is essentially the same game as this but in a near-future setting comparable to Command and Conquer, he praised the controls but had concerns over the lack of variation in the game and between its two warring factions. I’m coming to this series fresh though and have always liked strategy games that leave the 1000 page manuals, and historical accuracy, at the door and instead focus on quick and dirty warfare and that’s what you get here with the game as you take part in the struggle between the Lightbringers (the good guys) and the Deathsworn (the bad guys). 8-Bit Hordes introduces you to the gameplay pretty gently with the first mission (of either faction’s campaign) tasking you with getting your first army up and running and the second getting you to grips with the basic base building. As with something like Command and Conquer, there’s a process to this with a couple of considerations for when you are planning out your base. 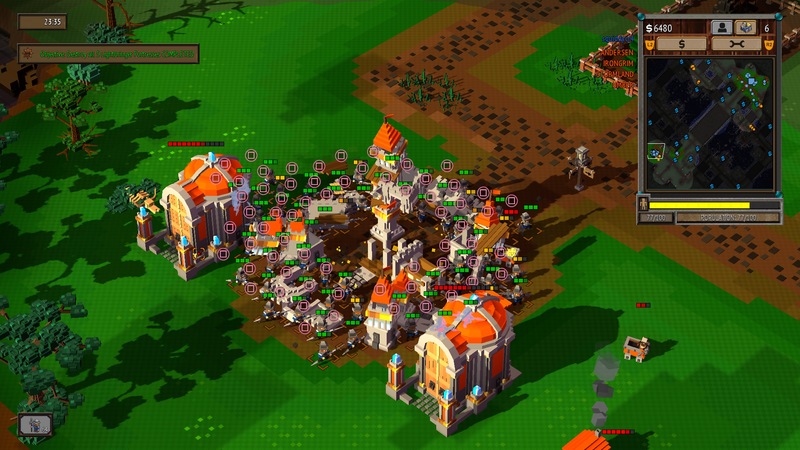 You need a barracks to create soldiers but they will also count towards your population which means you’ll need to feed your armies (using farms) otherwise you’ll be restricted by a low population cap. This all costs money which is obtained in typical resource gathering style by sending off minecarts to various mines and hoping that your opponent doesn’t destroy them. It’s pretty standard RTS fare in that regard but it does mean that you won’t be bogged down in micro-management. Building units is handled in a clever way that helps too simplify the controls, something that is essential when trading a mouse and keyboard for a DualShock set up. When creating a unit you press either , and to commit to their creation. They are then linked to that button, so pressing it will select any units linked to it. Allowing to activate a large section of your army in one go. This is where the horde aspect comes in as precise unit-by-unit control is hard to manage but sending in a fifty-person strong army to go right up and knock on the front door is a lot easier. Initially, that’s how the battles against the AI go. You build a ton of units, wait for an attack, send those off to battle while building a ton more units and rinse and repeat until the AI is beaten. It’s not long before the game does start putting up more of a challenge with special units really making a dent in your army and them pumping out reinforcements quickly enough to put up quite the defence of their assets. 8-Bit Hordes is no pushover with the fourth or fifth level of each campaign being where you’ll start really feeling the resistance from the AI, even on the easiest setting. This really is that basic Command and Conquer style of gameplay and the immediacy of that really is welcome. This is a game that you can get into pretty quickly although your building options are very limited at the start with new units and structures being unlocked as you work your way through the campaign. It does stop you getting overwhelmed by the tech trees but it does make things feel like an extended tutorial. While we liked the console-friendly controls, it did make the game feel quite imprecise in that you’re really just throwing three groups of units at the enemy. It’s easy if you, say, map your close combat guys to , your ranged guys to and specialist units to but what if you want some archers back at the base? Pressing will select all of them which makes tactical play a lot harder than it should be. In the end it really does end up being about creating hordes and sending them in, World War 1-style, into the meat-grinder. The game’s difficulty does get pretty harsh quite quickly and that detracts from the ‘strategy games for beginners’ style that the simple controls and visuals give 8-Bit Hordes and yet you’re not getting a complex XCOM style effort here so it’s a little hard to know who the idea target audience is for this game but we enjoyed it and were happy once the game started putting up a fight and we had to try out different tactics. But while we enjoyed that, some players may be discouraged by the challenge. Speaking of the visuals, this game sticks to the same isometric view that 8-Bit Armies had which has that colourful voxel look, similar to games like Crossy Road and Pac-Man 256. It looks great but it can be hard to pick out individual units in amongst all those blocky pixels. 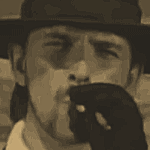 That said, making out most of the action is easy enough. The sound is what you’d expect. Retro music, the sounds of combat and construction and the occasional voice telling you what is happening on the map. It’s nothing special but not particularly lacking either and overall the presentation is pretty good. The name might suggest an 8-bit look and feel but this is definitely a game with modern polish. The game has the aforementioned campaign mode, a skirmish mode (which will be familiar to Command and Conquer veterans) and online co-op which allows you to play against factions from 8-Bit Armies which is an interesting bit of functionality but does speak to the overall sameyness between games in the series. Don’t expect to get much action online though unless you can line up some like-minded buddies to play against. 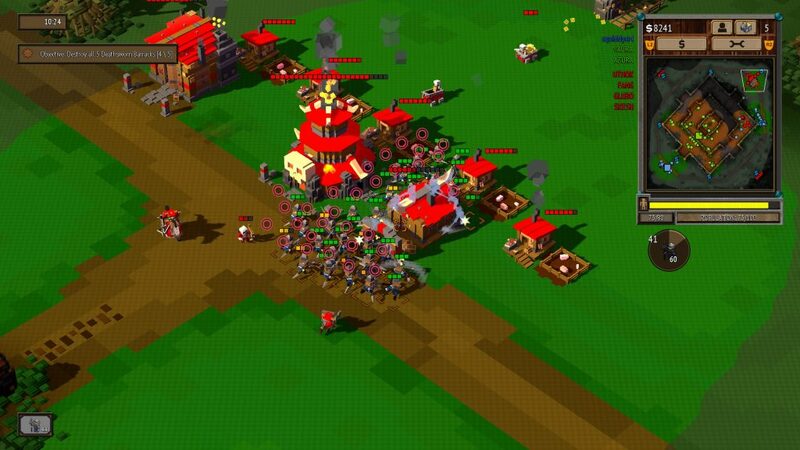 Overall though 8-Bit Armies is a fun, accessible-yet-challenging, RTS that speaks to the dev’s heritage. It’s a shame that there’s no plot to speak of, especially in light of the legendary cutscenes of the Command and Conquer games, but if you want a strategy game to dip into. 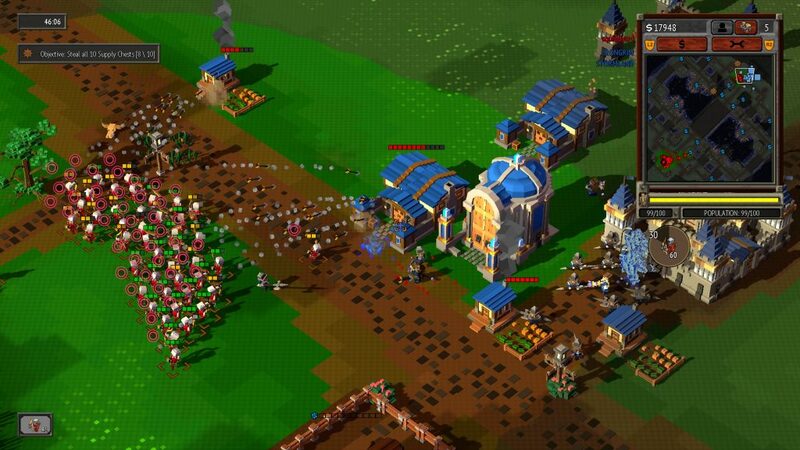 8-Bit Armies is an enjoyable RTS that will appeal to genre newbies and fans of the old Command and Conquer games but it could do with a bit more variation and the lack of a story takes away from the game's personality a bit.